* This overview explains our class flow. There are individual differences in how fast dancers progress through the levels. This scheme is an indication for a dancer who attends all classes, goes social dancing and practices regularly. If you missed classes, do not have time to dance between classes, or just want to take things a bit more slowly, it can feel better to repeat a block before you join the next level. Your teachers will help you pick the right class so that you are sure to enjoy the lessons. NEW: Speciality classes From February 2019, we also offer Speciality classes taught by our out-of-town guest instructors Natalia and Kay. 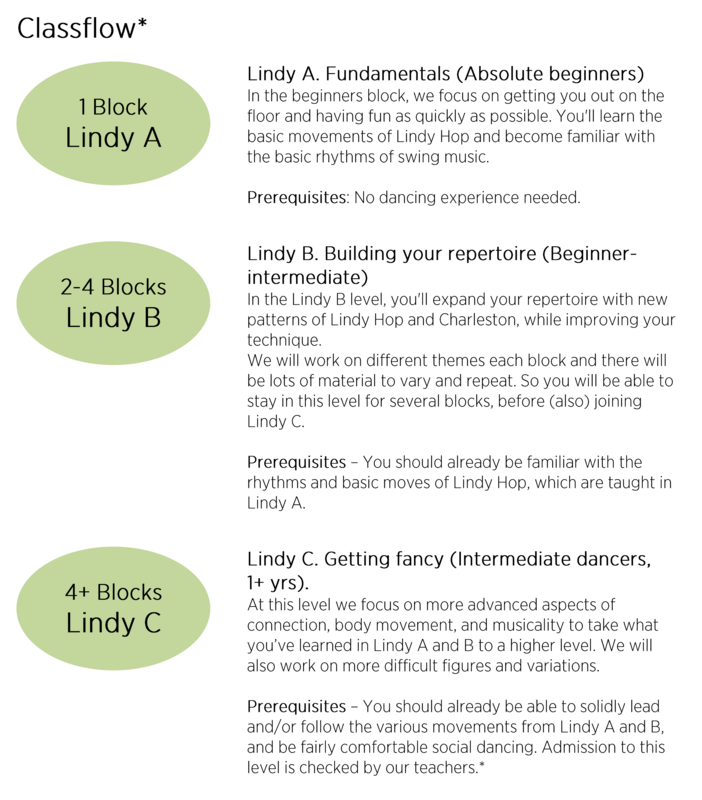 They are aimed at a B to C level, so you can join the speciality classes when you have danced Lindy Hop for at least 5 months (i.e. at least one block in Lindy B). While the A/B classes follow a fixed curriculum to build a complete repertoire of the basic moves and techniques of Lindy Hop and Charleston, the theme classes dig deeper into a different, special topic every block. Read more about the theme of this block here.